For 2019 (our 8th year! 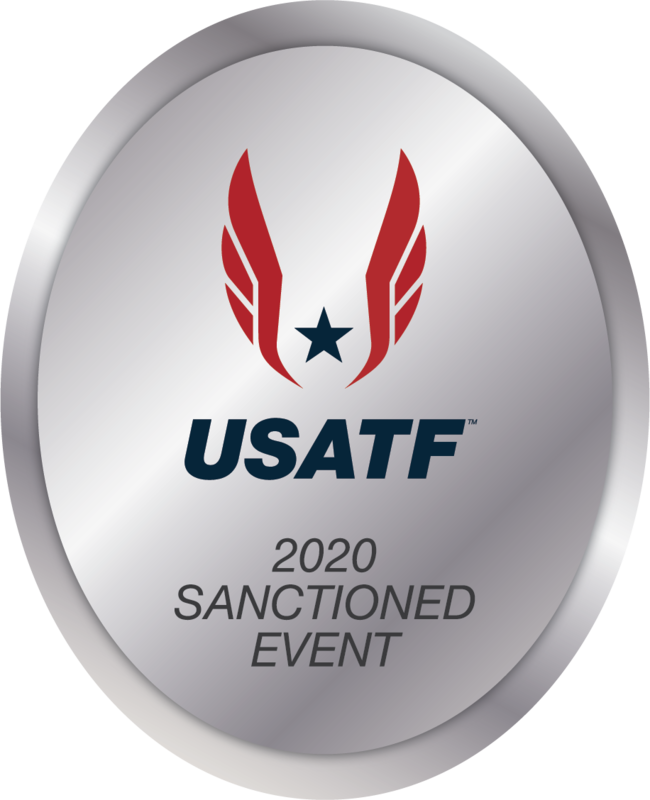 ), we have CASH PRIZES for the Half Marathon ($300 to the male and female winners; $100 to the male and female 2nd place runners), and USATF Course Certification for the Half Marathon (NY17052JG). 2018 Race Results are in! It was a wonderful race on a wonderful day! Here are some photos, too! Be sure to keep an eye out for your finisher's videos in the next couple of days from RunSignUp! Gold Sponsors include Rochester Running Company, Lattimore of Pittsford Mendon Physical Therapy, The Palmer Family of Companies (Palmer Food Services, G&C Food Distributors Inc, Palmer's Direct to You Market) and Dunkin' Donuts of Honeoye Falls. Silver sponsors include Honeoye Falls Marketplace/Mendon Meadows Marketplace, and Mendon-Honeoye Falls-Lima Sentinel. The finish of the 2017 Black Diamond Express Half Marathon. The Lehigh Valley Trail is the former home to one of the most celebrated American railroads of all time: The Lehigh Valley — home of the famous Black Diamond Express passenger train, which ran from New York to Buffalo. While the land that comprises the Lehigh Valley Trail is owned by Monroe County Parks, this rails-to-trails project was created by (and is maintained, year-round by) a small but passionate non-profit group called the Mendon Foundation, and we at the Mendon Foundation depend on privately-collected donations and volunteer help to mow, groom and improve it so that you can continue to enjoy it, year-round, for walking, hiking, biking, running, and more. If you’re a runner, one of the best ways you can support the Trail and the Mendon Foundation is to run the Black Diamond Express Races, on Sunday, August 25, 2019. Register early for the best prices online or on paper. The Black Diamond Express 5K starts in the Hamlet of Mendon near the baseball fields south of Route 251, runs 1.55 miles west toward Chamberlain Road, turns around, and ends right where it began! The Black Diamond Express Half Marathon starts in the Hamlet of Mendon near the baseball fields south of Route 251, runs 6.55 miles west toward Rush, turns around, and ends right where it began! The Black Diamond Express is the first half marathon event in the southeast portion of the county – and a flat and exceptionally beautiful one at that! 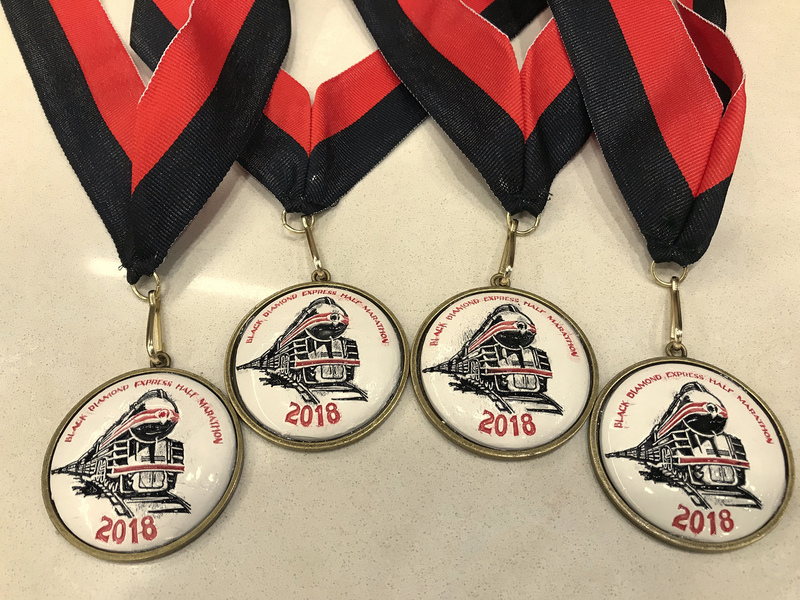 Here's what the 2018 handmade ceramic medals by Mendon's very own Geoff Gretton look like! "This was my first Half Marathon, and I've done several since... would recommend this to others considering doing their first. Reasons include it being a flat course, the trail is easier on your joints than pavement, it is well organized, and there are bathroom facilities on the course should you need them." "Well worth our stop on our visit to Upstate NY"
"Nice flat course through the woods"
"Fun, fast and flat!!! I would definitely do the Black Diamond Express Trail Race again!!" "I had a great time racing at one of my favorite running locations." "The Black Diamond Trail Race is a unique venue... flat, smooth and a perfect stone running surface. This retired railroad bed is a beautiful run through mostly shady woods with occasional highway crossings. Watch for deer, and listen to the birds." "Great beginner trail race! 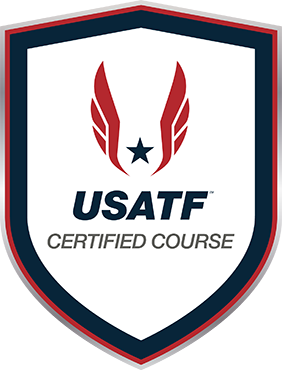 Perfect tune up race leading up to a marathon race." "It is a great race. Flat course and friendly people! I would do this again next year!" "Trail running at its finest! Awesome for skilled trail runners who enjoy a flat course; excellent experience for newer trail runners! Friendly experience for all!" "Fast and flat in a fabulous setting!" "One of the flattest courses around. It was a nice out and back race through the woods." "This is a hidden gem on well-manicured roads supporting a great cause. Drew and his crew really love what they do, and it shows. A must do event!" "Great, well-organized race! I'll do it again for sure!" "Top notch event - extremely well run, trail was in excellent shape, volunteers were awesome. I'll see you next August for sure!" "Thoroughly enjoyed my first trail 5K. I'm looking forward to joining again next year!" "The best run race with friendly volunteers that I have run! Each mile was marked and there was the perfect amount of water/Gatorade stations. It was very family friendly and the post race food was great. I would definitely recommend this race and will do it again next year!" "Well organized, great course, good time had." "Love Trails? Run the Lehigh Valley Trail. You would come back for more!!" "What other half marathon lets you pretend to be a train?" "Highly recommend! Add this to your race calendar!" "A fast, flat, and friendly race on a beautiful trail." "Great flat, fast race in the woods!" "A great race for all ages on one of the best local trails in upstate New York." "You couldn't ask for a better trail half marathon." "Great race on a flat and well maintained trail - seize the opportunity to unleash your inner locomotive!" "I had never heard of this trail but would absolutely do it again"
"This was my first ever half marathon and so I loved that it was flat and shady and the staff were so friendly! Great location!" "A beautiful run along the Lehigh Valley Trail for a challenging but fast half marathon. Will be sure to do it again!" "Great trail, great scenery, great volunteers! Will definitely run again!" "Beautiful course and well-supported. This was a fun race! I'll be back next year." "A well-organized race on a smooth, easy and attractive trail. Highly recommended." "It was great to run a race where you pass by every single person at some point. Most of us cheered each other on which brought a positive spirit to the day." "The best Rails to Trails race in the area"
"Fast as the Black Diamond Express!" "The Black Diamond Half Marathon is unique with its historical rail road setting, pristine nature surrounds, flat and fast trail run held at a perfect weather time of the year." "Great, flat half. Lots of shade for those looking to run a half in the summer heat. Volunteers are awesome!" "This is a local fun race. If you've always wanted to do a half marathon - this is the one to get your started!" "The up and back is great to be able to see the leaders of the race." "The volunteer support on this race was tremendous and they helped make it a fun morning." "Loved this location, out and back course and the organizer." "A nice end-of-summer race with friendly volunteers in peaceful setting." "If you want it , you’ll find a way.....if you don’t you’ll find an excuse." "Flat, fast, out and back trail race. Very well organized with great post race refreshments." "Support a very worthwhile cause." "This race is a beautiful adventure through a natural, uplifting setting. A great change from the usual road race!" "Great race for a PR." "Well run, good refreshments (including chocolate milk), extremely friendly atmosphere, beautiful finisher medals (half marathon), gorgeous trail ... can't say enough good things about this event!" "A very well run race; one of the anchors of my summer racing schedule." "Beautiful trail, well organized race!" ⇒ Bookmark this page, check back often as 2019 develops, and visit us on Facebook, too! © 2015-2019 The Mendon Foundation, Inc.